It seems as if AMD may again be hampered by the FABs. Low yields, and getting SOI (Silicon on Insulator) technology down pat have put the K8 about a year off schedule. If the Athlon64 were released last year around this time, as many had expected given the vast number of K8 motherboards on display at Comdex 2002, it would have easily destroyed Intel's Pentium 4 in terms of performance. And that would have been entering into the market at 1.4GHz. However as the Athlon64 stands right now, it's certainly going to be an interesting fight between the two, at least in the 32-bit arena. While we unable to test the Athlon64 3200+ under a 64-bit OS, with 64-bit benchmarks, AMD's own material suggests that the chip would far out perform both the Intel 3.2GHz, and indeed even the Athlon64 3200+ itself under 32-bit applications. The Athlon64 3200+ has a real clock speed of 2.0GHz and as you can see from the picture above, looks similar to that of a Pentium 4 processor, though is physically larger and heavier. There are 754 pins on the bottom of the processor and AMD has incorporated an integrated heat spreader to protect the fragile silicon core. The IHS will certainly save us from any more horror stories crushed or chipped cores. Unlike the Pentium 4 however, there is no hole on the top of heat spreader to absorb copious amounts of thermal compound. Weighing in at 105.9 million transistors, the Athlon64/Athlon64 FX is easily the most complicated desktop processor in the world. The AthlonXP Barton core had just 54.3 million transistors, and the Northwood Pentium 4 a paltry 55 million. The processor is built at AMD's Dresden, Germany wafer fabrication facility and uses 0.13 micron manufacturing technology. It is expected to move to 0.09micron process early in 2004. The Athlon64 runs at default voltage of 1.5V. 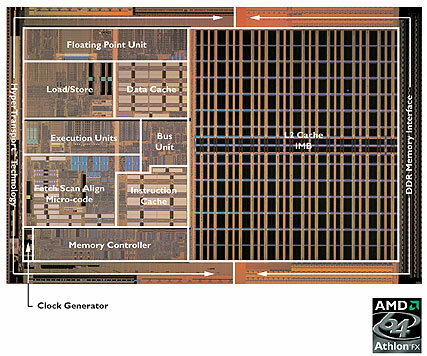 The silicon die of the processor measures 193mm2 squared, and about 50% of that is allocated to the large 1 MB L2 cache. While we're not going to talk about this too much, it should be noted that all Athlon64 based processors also have Intel's own SSE2 technology built into the core. Now AMD will also benefit from those programs that get a large performance boost due to SSE2.